Richard Frumess, President of R&F Handmade Paints, shares his experiences using the Munsell color system to test for lightfastness and create color standards for their high-quality oil sticks and encaustic paints. Lightfastness testing is a standard for all paint coatings whether for industrial or artistic purposes. Most artist paint mediums, such as oil, acrylic, alkyd, water color, or tempera, have recognized lightfastness ratings. This is important because some pigments that are lightfast in one medium are less so in another. Encaustic paint is a wax-based medium, and although it has a history going back to ancient times, it has only recently been widely used in contemporary art. As a result, encaustic has never been evaluated under American Society for Testing Materials (ASTM) standards for how lightfast pigments are in that medium. 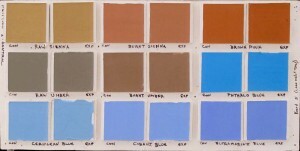 R&F Handmade Paints is one of only a handful of manufacturers of encaustic paint in the world. One of our main distinctions is that we have been the primary educators and testers of this paint through our encaustic workshop program. This year, we conducted the first ASTM regulated lightfastness test through a testing lab in Arizona, in which the color specimens were exposed to the sun for a 3-month period from January through March. The ASTM regulations require the specimens to have a certain uniform reflectance level, which can be determined through a spectrophotometer or by eye, using a Munsell Value Scale. Being a small company, we do not have the resources for expensive equipment, so we opted for comparing the colors to the Munsell scale. This meant making white tints for most of the colors to match the 5-6 value range, which was then double-checked on a spectrophotometer by the lightfastness rating lab. We gave the lab 2 sets of specimens. One was kept out of the light, while the other set was exposed. After 3 months of exposure, the results were that most artist grade pigments are lightfast.